Your life savings is at risk and there are plenty of people looking to steal it from you. Those include sophisticated and suave individuals whom you have trusted with your financial health: your financial advisor, stock broker, financial planner, accountant, lawyer and potentially many others. They hold themselves out as financial protectors. As this book shows, those trusted financial curators could have plans to steal your savings and make your money theirs. 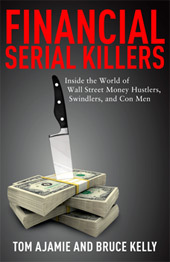 Since the immediate aftermath of the financial crisis when we published the first edition of Financial Serial Killers, the overall landscape for the financial safety of average Americans has turned bleaker. After the $50 billion Madoff financial scam, the $7 billion Stanford Financial rip off, and thousands of other multimillion-dollar Ponzi schemes, frauds and thefts, you would think that our leaders in Congress and the Securities and Exchange Commission would have tightened up the loopholes that allow the scammers to flourish. Or that the standards for being allowed to manage your money would have been heightened. We should have seen a full-court press by the financial industry to clean up its act and toss out the bad apples. But nothing like that happened. More than five years after the crash, the average American is still on his or her own to protect money and savings from the evil geniuses who are devising plans at this very moment to take it. We are still gravely concerned with the lack of change to market and regulatory structures that allow Financial Serial Killers to flourish. Think you are in good hands at a so-called brand name bank? Consider this news story that appeared recently on the front page of The New York Times. A Wells Fargo financial advisor pleaded guilty to stealing from client accounts. The advisor, likely not acting alone, traded stocks in his clients’ accounts. When the trade was profitable, the advisor canceled it in the customer’s accounts and moved it to his own personal Wells Fargo account, acting as though the profitable stock had been bought originally by him for his own account. As for the stock trades that lost money, he left those in the customers’ accounts. Banks and brokerage firms are supposed to have very rigorous checks and balances, compliance programs, software systems and other safeguards to protect your money. This really should be impossible today for such a Financial Serial Killer to flourish. But at Wells Fargo he did. The Wall Street Journal has brought to light the problem investors face with finding out the truth about their brokers. Broker profiles, housed on the website called BrokerCheck, which we describe later, are at times inaccurate and reveal far less information about a broker than an investor needs to know. One article revealed that there were more than 1,600 stockbrokers whose BrokerCheck records failed to disclose bankruptcy filings, criminal charges or other red flag in violations of regulations. Another report showed that stockbrokers who failed their first attempt at a basic exam to sell securities, known as a “Series 7” in the industry, are far more likely to have customer complaints on their records than those who passed with flying colors. Several years after the crash, investors continue to struggle with banks, brokers and the regulators who run BrokerCheck. A Financial Serial Killer even had a starring role in a recent hit movie. Martin Scorsese’s “Wolf of Wall Street” showed how a Financial Serial Killer thrived and lived the high life, all fueled by the little investor’s money. We write in Chapter 6 about the original Wolf of Wall Street, Jordan Belfort, and a broker who worked for him. We wrote about Belfort’s breathtaking ability to manipulate investors long before the story was turned into a movie for all to witness his alcohol-drug-stripper-mansion-party lifestyle. Moviegoers were captivated but appalled to think that a guy who was hired and licensed to manage other people’s money was actually nothing more than a petty, self-indulgent maniac who blew their life savings on himself. We know that other such Financial Serial Killers, who steal to indulge their taste in cars, boats and other trappings of excess, are lurking in the financial landscape. We were not making the claim that all stock brokers or financial advisors lacked ethics or had evil intentions. Indeed, your local financial advisor is often the first to spot unethical or shady business practices of a local scam artist and will alert officials and securities regulators of those misdeeds. History has shown that brokers and advisors, including Belfort, can’t resist stealing your money. In this book, we lay the frauds and cons out for you in unadorned detail. After this read, you will be well prepared to spot â€“ and avoid â€“ the types of scams and con artists we portray in these pages. Financial Serial Killers clearly and simply highlights the warning signs you should heed to keep secure your retirement nest egg, home and kids' money for education. You’ve worked your entire life to build up your savings. Or maybe someone else in your family built up this nest egg and then passed it along to you. Either way, this is your money. You need it for your medical care, your basic daily needs and your retirement. You must give serious thought to the person, bank, brokerage firm, insurance company or investment advisor who you will hire to manage it. Read the book. It’s a quick, concise step for you to take in order to protect your hard-earned wealth.